One of the most maligned rock bands of the 70's, Bachman-Turner Overdrive proved that critics didn't mean a damn of Joe Blow loved your music. BTO truly appealed to the Everyman, a rough brutal "let the tape roll" rock music with not many chords, most of them major, and a fixation on just a few topics: driving ("Roll On Down The Highway," "Four Wheel Drive") working ("Blue Collar, "Hey You"), touring in a rock band (the wonderfully-named "Rock Is My Life, This Is My Song" and "Not Fragile") and good old 70's sexism ("You Ain't Seen Nothin' Yet," "Let It Ride"). Then, to top it off, these guys all looked like bearded mountain men, as hairy and beastly as their music. The irony of BTO was the pedigree of guitarist/singer/songwriter Randy Bachman, who did the same chores for the fabulous Guess Who in their late 60's heyday. There was nothing in the Guess Who's songbook to suggest that Bachman had this primal loud and amp-ed up rocker in him wanting to get out, much like William Hurt's peyote tripping deprivation tank professor in the film "Altered States." Paired with C.F. "Fred" Turner and his brother Rob on drums, Bachman's quartet went on to sell a bazillion albums for Mercury Records. Bachman-Turner Overdrive II was the breakout album with two huge singles, "Let It Ride" (always my favorite) and what became an eternal classic, "Takin' Care of Business." 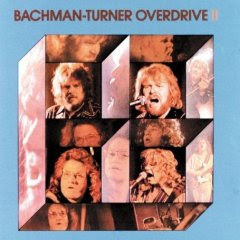 A third Bachman, Tim, appeared on just this one album before he got the boot, singing on the FM cult song "Blown" ("woo-wooo!"). You didn't listen to BTO because of their artistry. There was nothing fancy here. They didn't reinvent anything. Both Bachman and Turner were hoary scratchy vocalists. And they didn't produce any great Dylan-like visions in those three magic subject matters they sang about. Nope, you listened to BTO because it was big dumb rock music that was catchy, the kind you poured a Rolling Rock or Labatt beer down the old chute to. And when you wanted to teach yourself a BTO song on the guitar, it would usually take about, oh, five minutes to nail down the chords. Sometimes, Bachman would really throw a curveball and dish out some jazz chops and solos just to show he could play more than your average heavy barre chords. On Bachman-Turner Overdrive II's "Welcome Home," most of the song is just the usual heavy riffing, when all of sudden, for no reason whatsoever, the drums start playing swinging bebop, while Bachman goes noodling around with Charlie Christian-like octaves and solos. Try, try, try, let it ride. And would you cry if I told you that I lied? And would you say goodbye or would you let it ride? Good bye, hard life, don’t cry, would you let it ride? The genius of "Let It Ride" is it just won't quit, damn it. The chorus guitars really ring, the melody is really catchy, Bachman has this searing guitar counter-melody that underscores the chorus, he has the dumbass guitar solo, and then the big drum breakdown where it's "Ride, ride, ride, let it ride" getting louder and louder until they're all screaming "Won't you let it ride?" until it just stops. That's the false ending, because those ringing chorus chords that open the song come right back in after a beat, with the boys all screaming and whooping it up. Here's a strange video from way back when of BTO performing "Let It Ride" in concert, while the lighting director shouts out his cues.